pampas2palms: Milestone or a millstone? I feel duty bound to write something although I have to admit the creative juices are not flowing, at least not through the medium of words. So why the compunction to put the proverbial pen to paper? (Should that be fingers to keyboard?) Well after running this blog for nearly two years, we have finally passed the magic marker of 5000 hits - actually 5181 as I write. (Philip says he was up all night clicking on the link to up the numbers!) Bearing in mind the limited comments I receive, I do wonder how many of those hits link to actual readers. So you see I feel duty bound to satisfy my regular readers. Yesterday I did visit a sculpture garden but it wasn't very photogenic. 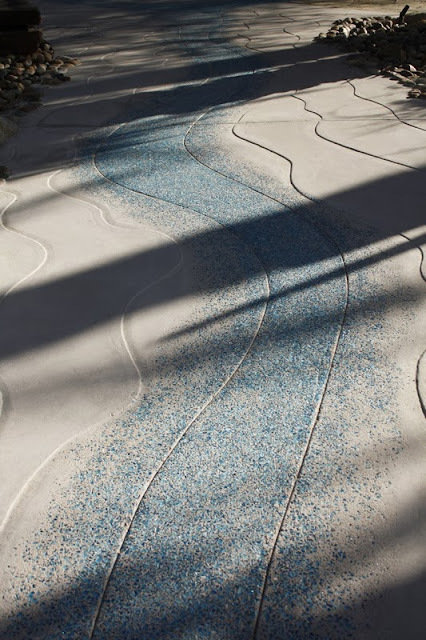 I did however love the use of blue glass within the concrete pathway and shadows out here in the low winter sun can be dramatic! Very sparse foliage on this tree with distinct veins tinged purple - any ideas what it is Chad? Not sure whether this is its normal branch structure or the result of barbaric pruning! Horticulturally, its a little barren. 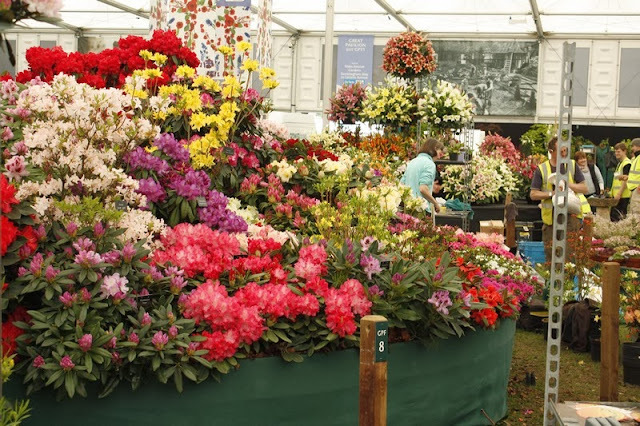 The book writing dried up two years ago which was sad - a downturn in the market they say but who knows why, with gardening as an all time popular pastime! I have several potential books at various stages but no publishers fighting over me - pity! Little progress in the yard here, basically because I have a shoulder injury that is slow to heal, so garden activities are on hold. Very frustrating as I'd love to get on with landscaping and planting our blank back yard. 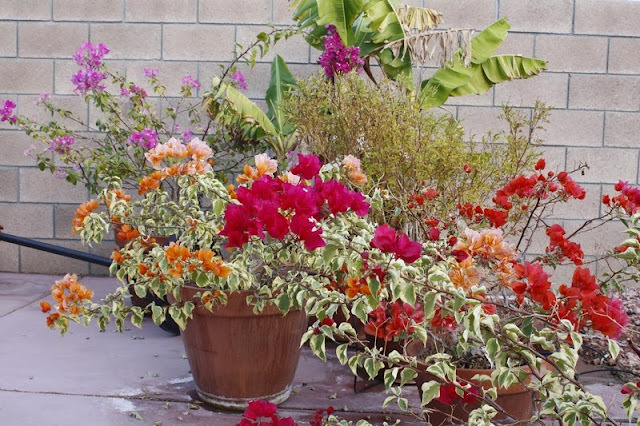 There is some colour as our potted bougainvilleas are flowering beautifully. Last year they were a mass of foliage but little flower. This year, they are less lush but a nice smattering of flowers - maybe neglect has paid off! So much space and potential when I can get on with it - so frustrating! Regular readers will know that for the last six years I have split my time between six months here in California with my partner Philip and six months back in exile in the UK. Now with a change in the law, the future here is looking quite promising. A couple of weeks ago we submitted all the documentation for a change in in Immigration status and Green Card for me and just today we have received the confirmation that this is being processed. It will be wonderful not to have to leave at the end of six months, although I guess I'll still want to return to the UK for some time in the summer - judge the shows, visit some gardens and enjoy the long summer evenings, which we don't have here. Just love the thrill of the flower shows, being involved and seeing the stands being completed before judging! I hasten to add that I haven't however become a total couch potato. Whilst my shoulder injury is preventing me doing much at the gym, I'm still running regularly with a current target of the 'mayor's ten miler' in January. Much of my recent time has been spent on my painting and this last week has been particularly busy. Lots achieved and an exciting development - more about that in the next blog which hopefully you will read! Must keep you guys coming back to keep the statistics up! Here I am , a regular reader commenting at last ! I think I found you on M&G's blogroll. I can only imagine the frustration of gazing out at a blank palette with physical limitations dragging the projects into a hold pattern. Best wishes to you and Phillip on your journey to green-card status. This equality is long over-due in my opinion. Many thanks to you for responding. Yes you probably did get here via M & G who have always been very supportive and helped me get started. Glad to hear you're still active and doing lots of nice things despite the injury. And good news on the progress of green card status, you will have it soon I'm sure and will no longer be at the mercy of the limitation of time you can spend there. Thanks guys - I value your continued interest and love reading your accounts too! Looking forward to seeing the final installment on the koi pool! i am a regular reader though i rarely comment, sorry! Thanks Dave - appreciate your comment! Must try and find some new plants to write about to keep you 'planty people' reading! Ficus religiosa is the tree in question. Another of the silent majority here who has recently relocated to Palm Springs from Chicago. 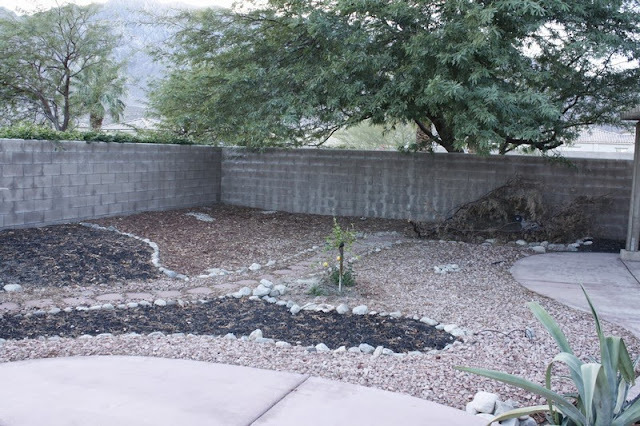 I'm selfishly awaiting your green card status so as to allow you more time to focus on the desert and share your keen insights on planting and design. 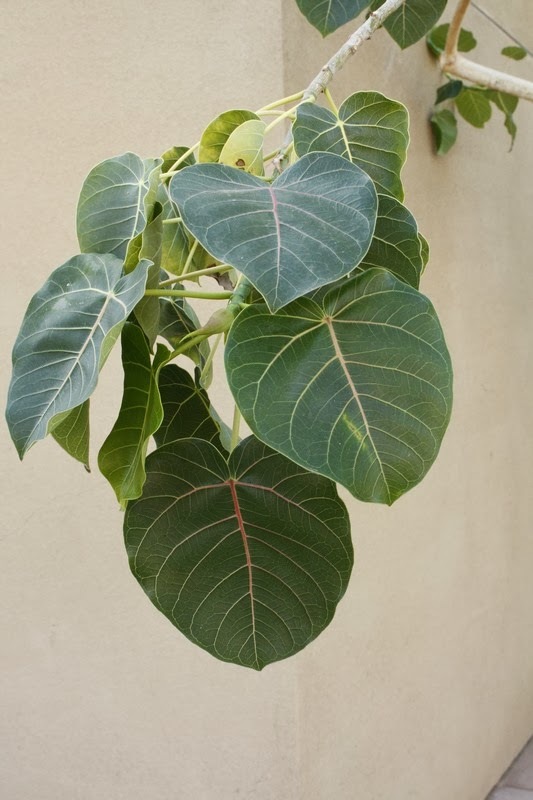 I agree with Anonymous that this is a Ficus, but I think religiosa has an elongated ‘drip tip’ to the apex of the leaf. So then which of the other 900 or so Figs could it be? 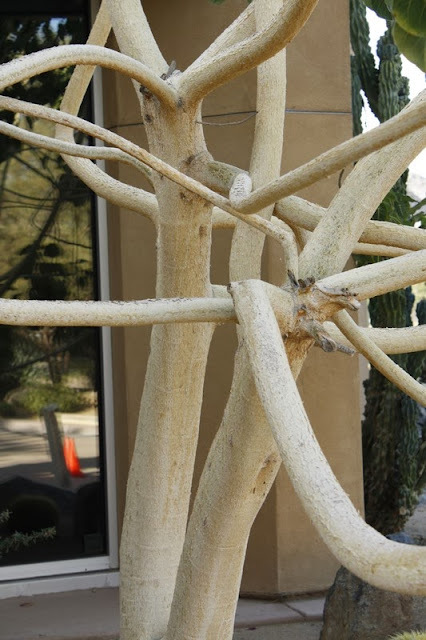 Given where you are, the thickness and venation of the leaf and the bark I think the very drought resistant Ficus petiolaris is the most likely. Hmm - interesting the plot thickens!